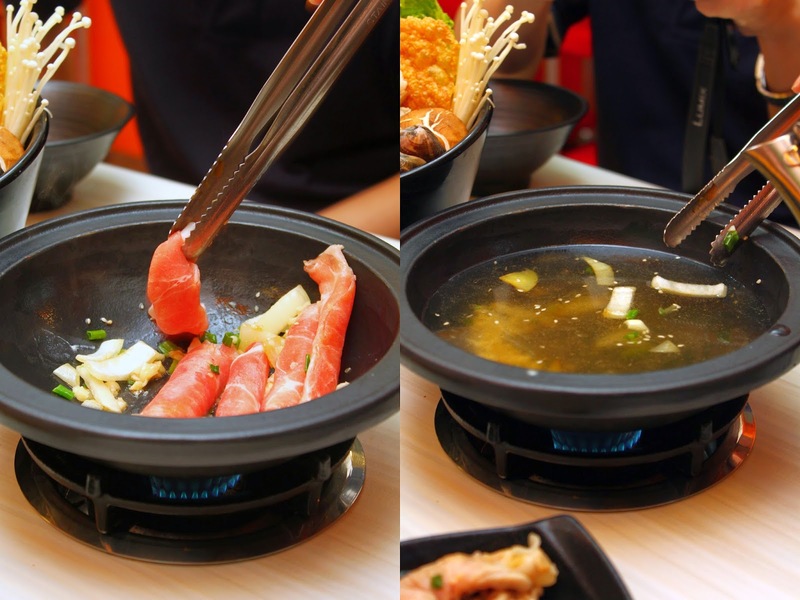 Occasionally, on cold days, I would love to have steamboat for either lunch or dinner. The problem is, despite my huge appetite as some may say, requires quite a number of people in order to experience and enjoy steamboat. I also do understand that there are several individual-type of steamboat or shabu-shabu available within the Klang Valley district, but most of them are pretty pricey. However, that ought to change, with Two Pesos Steamboat. Mix and match your own sauce. Recommended mixes are available as well. Started off with some Passionfruit Ice and Kochabi Winter Melon Tea. Both equally refreshing and rather sweet. First and foremost, there are 3 choices of meat available - Pork, Beef & Lamb along with 3 choices of mains - Rice, Yee Mee and Mee Hoon. This applies to all sets of pot. The signature Two Pesos Stone Pot was rather interesting. Instead of using any given soup, it was done by cooking off some shallots, garlic, spring onion and meat. When it is thoroughly cooked, only then the broth will be added. The flavours generated here was pretty subtle but flavourful enough as well. The set comes with a large portion of mixed vegetables. This was by far my favourite pot of the night. It uses milk as the base for the soup. Additional flavours were then extracted from the ingredients to increase the sweetness of the base. Meat and mains served with your choice. The Japanese Sukiyaki Pot comes with a bottle of soup, which was obviously filled with sukiyaki soup. The soup itself was at an acceptable level of sweetness, even with all the additional extract infused within the soup. However, if the soup is a tad too sweet, slowly adding additional soup from the bottle itself will help lighten the flavour and sweetness. This was my least favourite among those I've tried. Although served with an interesting pot, the soup was intense. Filled with various herbs and spices, the flavour was really off balanced. I can't tell what I'm drinking. Despite that, there were some who enjoyed it. Just personally not my bowl of soup. Also known as the most expensive on the menu, priced at a whooping RM16. Served in a Moroccan Tajine; it uses the basic principles of evaporation and condensation. Only a small amount of water will be added in the beginning. The stove will then be turned on to high, cooking the water and the ingredients inside, turning them into steam, then condensates back to liquid form, formulating the base for the soup. A very interesting concept for conserving water and maximizing flavour. This is also my second favourite besides the Milky Seafood Pot. One more interesting fact is that Two Pesos Steamboat allows take-away. Simply order the pot of your choice and they will prepare them for you. The soup and all the given ingredients will be placed at the larger bowl while the rice, yee mee or bihun will be placed in the smaller bowl. Expected a wait of 10-15 minutes though. Overall, I really did enjoy the steamboat at Two Pesos Steamboat. From the quality and taste to the pricing, I believe they are pretty reasonable. The portion was generous as well. No doubt I will return again.